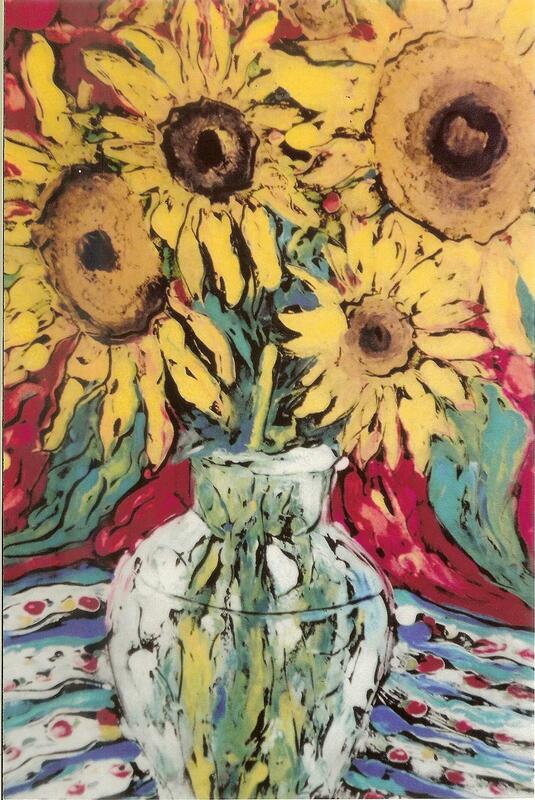 Do you know the difference between an original print and a print (reproduction) of a painting? If you don’t, you are not alone. In this age of reproducing printed items easily many people are not aware that printmaking is an ancient and revered discipline. 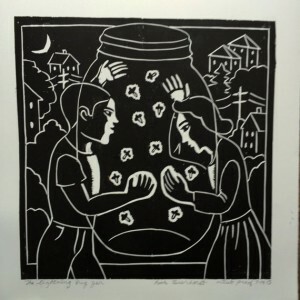 To learn more about printmaking and its history visit http://the-artists.org/history-of-printmaking Our April-May show explores the fine art of printmaking by featuring eight Michigan print makers and their work. I am honored to show the work of these artists. Rick Beerhorst is an artist with a vision. Although he may be best known as a painter presenting beautifully complex ideology, his block cut prints are clear, clean and concise. His imagery is personal and intimate and the black and white format presents his message with clarity. 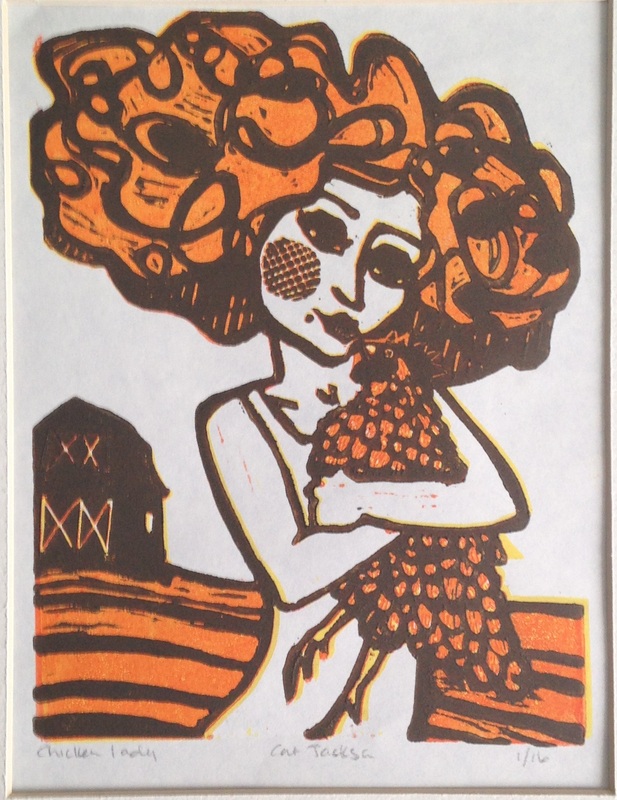 Lee Ann Frame is a West Michigan printmaking legend. 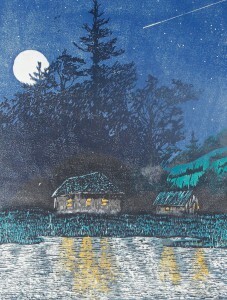 Her large prints are stunningly rendered and she uses multiple techniques such as intaglio, woodblock, chine collee’ and embossing to create her multilayered, sensitively presented pieces depicting nature and natural elements. Her pieces are visual poems weaving memories, dreams and imagination into a tangible and beautiful image. Cindi Ford gives us playful, intricate, multi process images in a one of a kind arrangement. Her compositions tell intimate stories and are created with separate printed elements using mezzotint, etching, screen printing, woodcut and other print techniques in a collage format. Similar printed features tie her pieces together but no two are the same creating a ponderable dialog between pieces. Cat Jackson is an explorer and an activist. She presents images of strong women, unarguable opinions, vibrant color and unlikely juxtapositions. Her reduction process block prints of figures and creatures are simple but succinct statements reflecting her personal focus and her fascination with the process of creating. Joan Larsen is a painter using a mono print technique to create her stunning compositions of natural still-lives. Her use of bold, layered color and larger than life images give her one of a kind pieces a beautiful and dramatic presence. Tom Rudd and Margo McCafferty have been collaborating on their reduction process wood cut prints for many years. Their images represent the world they inhabit. Trees, boats, fish, water and historic buildings are all beautifully and masterfully represented in their work. Andrew Jagniecki is an artistic chameleon. 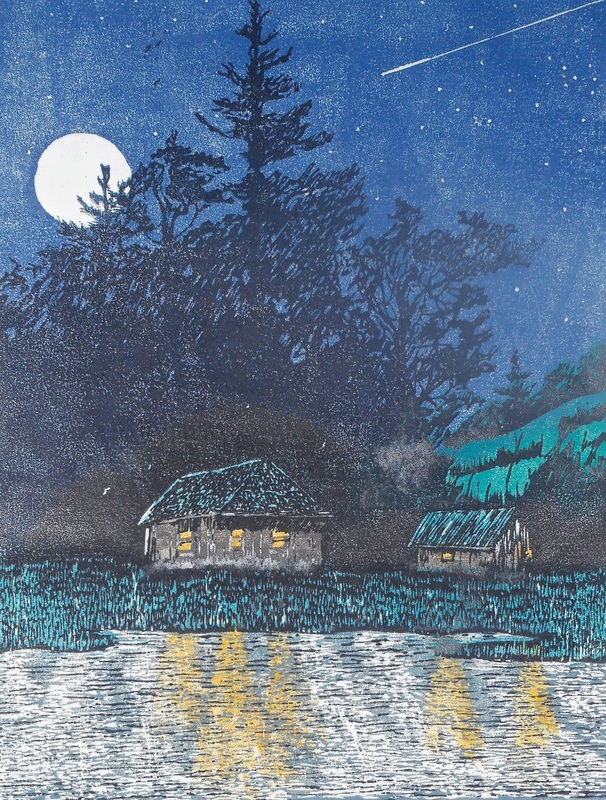 His printing ranges from stark black and white block prints to multi-layered sensitively rendered images of intricate places and objects. His subjects range from delicate bird’s nests to rock and roll icons and his dedication to his craft is apparent in his beautifully framed and presented prints and his use of different techniques to represent different images and ideas. 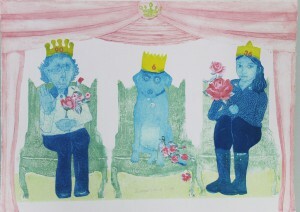 IMPRESSIONS: ART OF THE PRINTMAKER showing April 9-May 15. Please join us for an opening reception on Friday, April 15 from 5:00pm-7:30pm. Meet the artists, enjoy appetizers support Michigan artists. Want to see an artist at work? 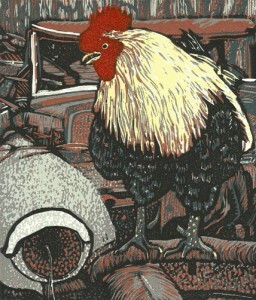 Visit us on Saturday, April 16 at 11:00 am for a block printing demonstration by Cat Jackson. Follow the process through the design, cutting of the block and hand pulled printing. 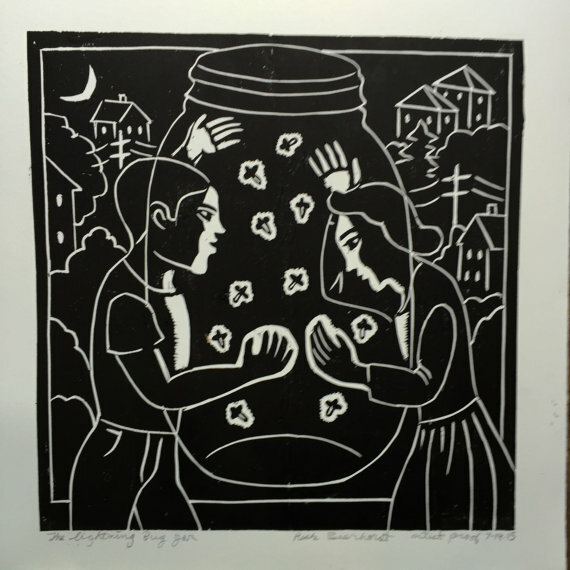 Would you like to attend a printmaking class?